This article is a short summary of Mario Kart Wii. 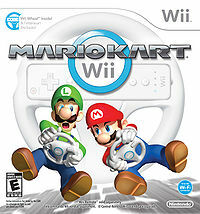 Mario Kart Wii is the sixth main installment in the Mario Kart series, released in 2008 for the Wii. It is the first game in series to include bikes in addition to karts. With 36.75 million copies of the game sold, Mario Kart Wii is the second best-selling game for the Wii as of March 31, 2016. Perform speed-boosting flips and wheelies with the flick of a Wii Remote or grab a Wii Wheel for even more fast-paced fun! Play friends locally on a single Wii, or hop onto Nintendo WFC for the biggest worldwide race yet!" The worldwide race is on with a whole new set of tricks, tracks, and ways to play! Place first in Grand Prix circuits or clear skill-based missions. Wii Wheel: Transform your Wii Remote in to a steering wheel that feels natural in anyone's hands. (Wii Wheel not included) New Wheels and Courses: cruise brand-new tracks and arenas, or enjoy a blast from the past going fender-to-fender on one of the classics. Tired of riding on four wheels? Bust out one of the all-new motorbikes for special tricks and techniques. Drawing on circuits and battle arenas from every game in the series—not to mention tons of brand-new ones—the true king of the Mushroom Kingdom racing circuits will finally be crowned! Time to get turnin' and burnin'!" Basic gameplay is retained from the previous games in the series, in that racers race across various tracks while using items to help them in placing first. The game feature eight cups with four tracks each. Single player modes consist of a mode where the player races computer-controlled opponents, a mode where the player battles computer-controlled opponents, a mode where the player attempts to make the best time in which a ghost can be saved and shared online, a mode where the player races such ghosts, and a mode where players compete in online competitions with various challenges. For multi-player modes, players can race or battle with up to four players locally, or race or battle with up to twelve players online. The aforementioned Battle mode is divided into two modes: Balloon Battle, where competitors use items in an attempt to pop the most of their opponents' balloons, and Coin Runners, where competitors try to collect the most coins while using items to steal coins from their rivals. KOR: 2014 A re-release of the game under the Nintendo Selects branding. This page was last edited on 3 November 2018, at 22:51.